Nissan has lifted the red sheet off their mysterious Gran Turismo car, and it looks like what you get when you cross a GT-R with a Koenigsegg. 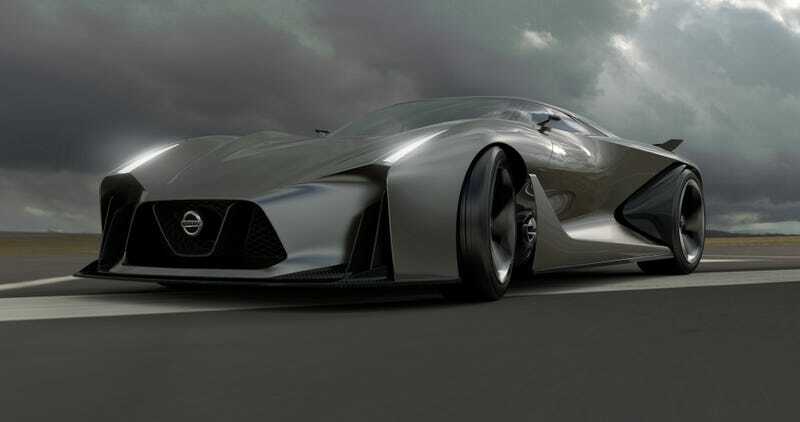 This is the Nissan Concept 2020 Vision Gran Turismo, and I think it looks pretty badass. We saw it from the back last night, and now we have the rest of it. The concept clearly has some styling elements derived from the current GT-R, especially in the the hood, headlamps and the shape of the greenhouse. But the rest of it takes Nissan's giant slayer to the hypercar level. Like the other Vision Gran Turismo cars before it, this one will be available for download in Gran Turismo 6 come July. But it seems to be more than just a video game car: Nissan says the Concept 2020 is "a vision of what a high performance Nissan could look like in the future." And with the next, probably hybrid GT-R currently in the works, this could give us an idea of what to expect. I'm totally okay with that. Who else is okay with that?